BSA Youth Protection – This is mandatory for each registered adult in a Pack or Troop. Protection training is designed to help you keep our youth safe from abuse. You will learn the Boy Scouts of America’s Youth Protection Guidelines, signs of abuse, and how to report suspected abuse. After each section of material, you will answer questions about that section’s topic. Completion is noted automatically in the BSA training records database if the module is experienced online Log in to the link above (MyScouting) to take this course online. 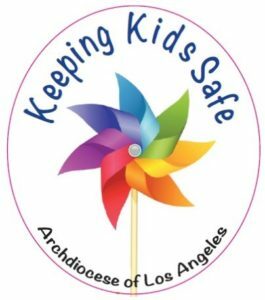 Safeguard the Children – Note: Every Holy family volunteer (parent, grandparent, family member 18+, caregiver etc.) 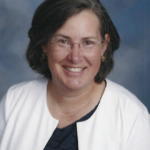 must have submitted the above mentioned requirements to both Holy Family School AND Holy Family Church prior to signing up to volunteer for supervising children in any capacity such as driving students to a field trip, serving hot lunch, attending overnight trips, coaching, SCOUTING, supervising students in the drama program or any parish program where an individual will be volunteering with or around children. 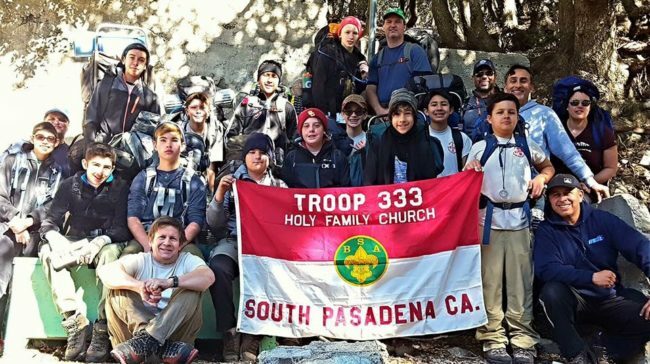 Scout Pack 333 is gearing up for another fun-filled year of adventure. 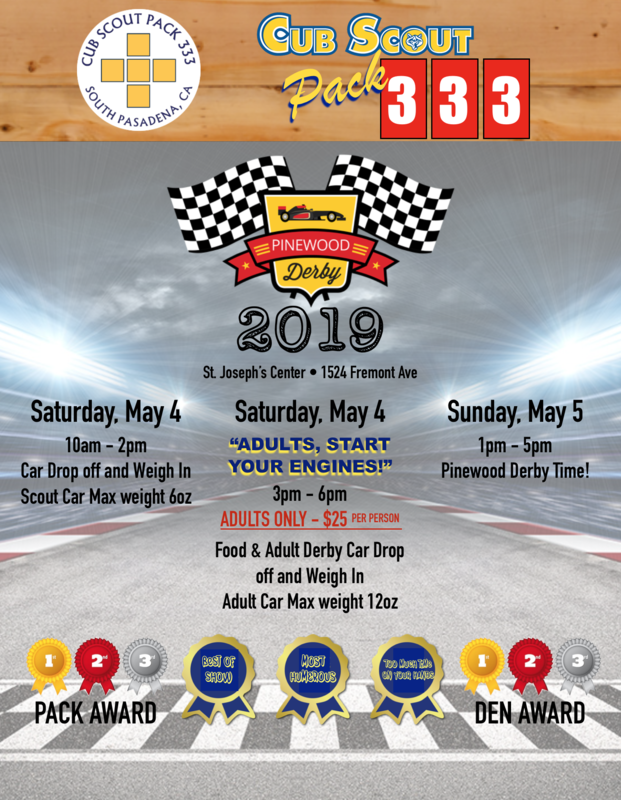 activities, monthly Pack meetings, hiking in local mountains, religious emblem, an annual overnight camp-out, Blue and Gold dinner, and the always popular Pinewood Derby Car Race. Cub Scout activities are centered around earning badges that are specific to each school grade level. This badge represents a rank. 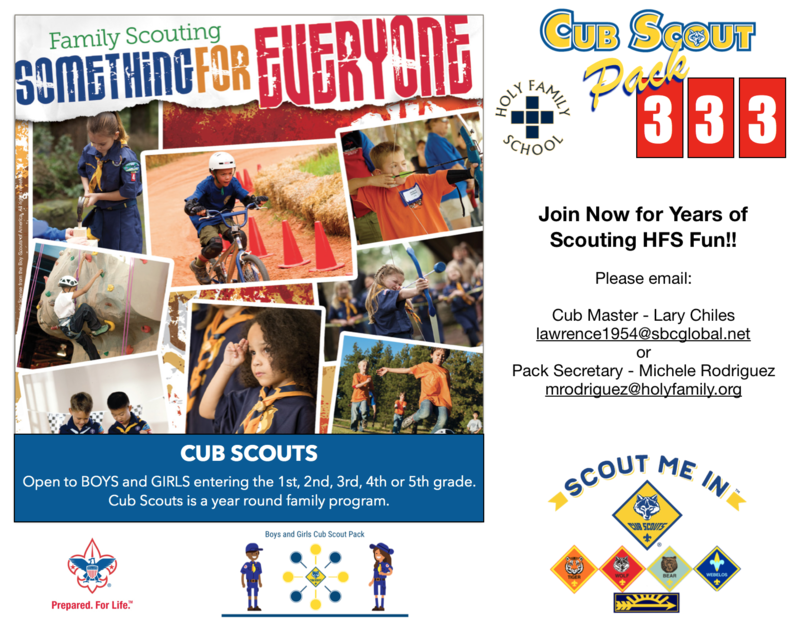 Advancement refers to the progress a Cub Scout makes toward their badge of rank. 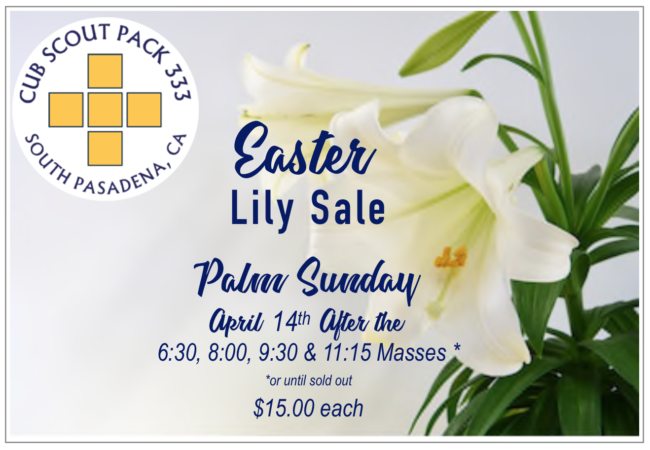 lawrence1954@sbcglobal.net or Pack Secretary Michele Rodriguez at mrodriguez@holyfamily.org There is a registration fee. 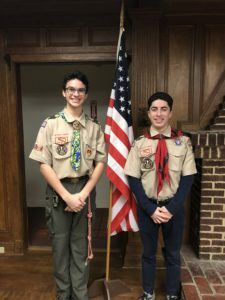 The Boy Scouts of America prepares young men to make ethical and moral choices over their lifetimes by instilling in them the values of the Scout Oath and Law. 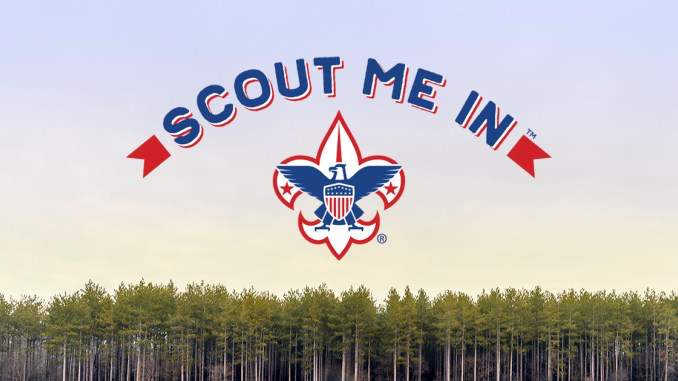 Boy Scouts focuses on important life skills such as personal responsibility and accountability, mindfulness of others, the ability to be self-sufficient, as well as setting and attaining goals. There are more than 150 awards you can earn as a Boy Scout. 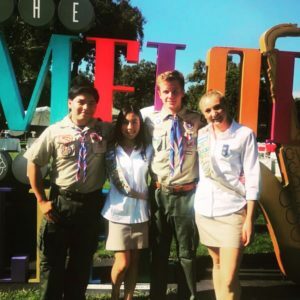 Whether it’s a rank advancement, merit badge or one of the many other individual awards, there’s plenty for you to set your sights on. Proudly we have had 86 young men achieve the rank of Eagle Scout since 1926. 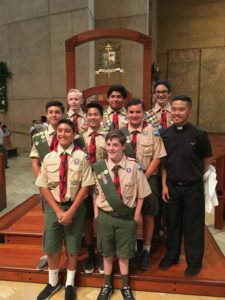 Boy Scout Troop 333, is sponsored by Holy Family Church. 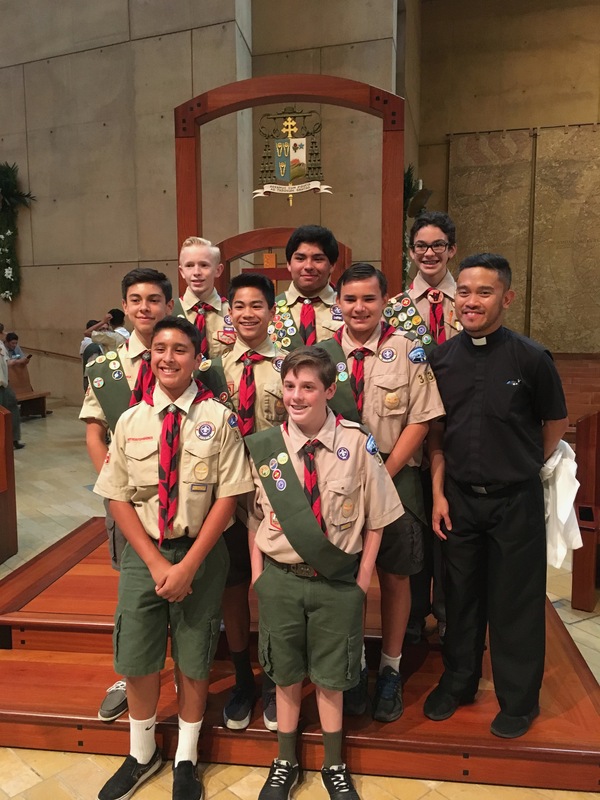 The troop welcomes Catholic and non-Catholic BOYS AND GIRLS between the ages of 11 and 17 from Holy Family School, as well as other parochial, private and public schools. 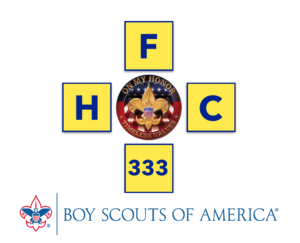 Meeting are held on Mondays from 7:30 p.m. to 9:00 p.m.
Troop 333 was founded 90 years ago and has been registered for over 60 consecutive years. 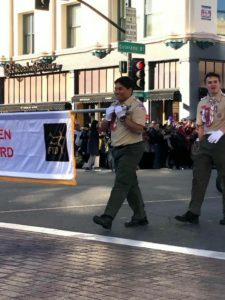 Boy Scouts is a boy lead organization, with the older Scouts setting the example and providing leadership for the younger Scouts. The adult leaders support and encourage the Scout Leadership.